Trailhead: 1 mile east of the Circle X Ranger Station. Getting to the trailhead: From Malibu, drive west on the Pacific Coast highway one mile beyond the Ventura County line, and turn inland on Yerba Buena Road. Go north six and a half miles to a parking lot on the left. Our trail goes uphill from the lot. The Ranger Station we passed a mile back is a good source of information and we could have stopped to say "Hello" and ask questions. 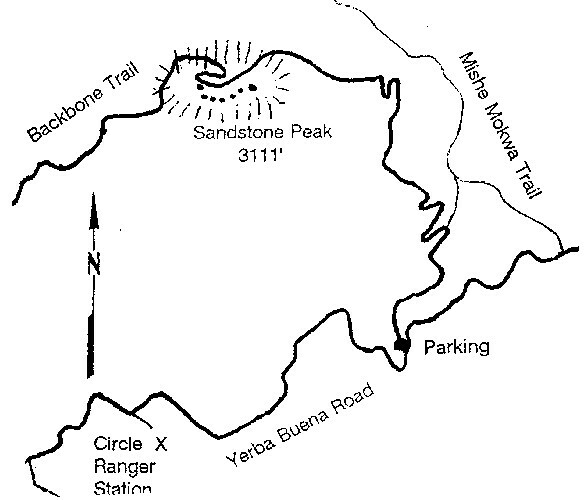 A time may come when we might want to climb Sandstone Peak via the shortest hike and the least elevation gain. I believe this will do it. Expect a steep and rocky trail, great views, and spring wildflowers. We find that it is uphill most of the way. Starting at an elevation of 2050 feet and climbing to 3111 feet in two miles doesn't allow many level sections of trail. As we climb, the scenery takes on a new dimension. Off to our right, deep down in the canyon, Carlisle Creek tumbles its way toward Lake Sherwood. Above Echo Cliffs we can see Balanced Rock although it loses some of its grandeur when below and far away. In time mountains of the Los Padres National Forest come into view north of us. Snow covers the crest of the Los Padres in winter. As the trail levels off we may note a huge boulder across our path. Early in 1998 this boulder came sliding down onto the trail, uprooting some large trees, partially blocking our way. Hikers have little trouble getting through, but this incident reminds us that Mother Nature does not take it kindly when people bulldoze deep cuts into steep hillsides. After our trail crests and starts a slight decline we look left for a trail to the top of Sandstone Peak. It starts as a series of steps cut into the rock and requires us to climb with caution. When we reach the peak, approach the edge slowly because the south side is a cliff. Sign in on the book if you care to. Notice that a plaque states the peak is Mt. Allen. Everyone knows by now that the peak is volcanic rock, not sandstone. Savor the view for we are on top of our world. If I knew for sure that the seven off shore islands whose names begin with San or Santa were named for Saints, I would propose naming this short but rugged trail the "Seven Saints Trail." Los Angeles sprawls out east and southeast almost as far as we can see. The Pacific Ocean dominates the south as far as the eye can see. After we retrace our steps to the main trail, we tighten the laces on our boots for a two-mile downhill hike to the parking lot.